Venezuela has revoked or denied press credentials for seven CNN journalists working in the country for what President Nicolas Maduro called “war propaganda” amid coverage of anti-government protests. Before the conditions on credentials were announced, Maduro said he would eject CNN from the country if it did not “rectify” its coverage amid a spike in the unrest that has gripped Venezuela. According to officials, at least eight people have been killed since demonstrations mounted by the opposition turned violent last week. "They want to show the world that there is a civil war in Venezuela," Maduro said of CNN in a televised speech on Thursday. He added that CNN was not showing "the people working, studying, building the homeland." 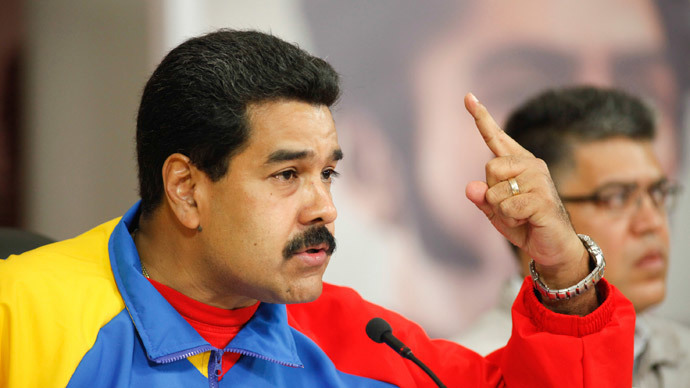 "I've asked the [information] minister to tell CNN we have started the administrative process to remove them from Venezuela if they don't rectify [their behavior]," Maduro said during the speech aimed at supporters, according to Reuters. "Enough! I won't accept war propaganda against Venezuela." The seven journalists – working for CNN International and CNN en Español – were notified later on Thursday about their credentials being revoked or denied. Despite the move, both entities said they will continue to broadcast from Venezuela. Maduro did not mince words when describing how he viewed CNN’s coverage of demonstrations that have challenged his authority. 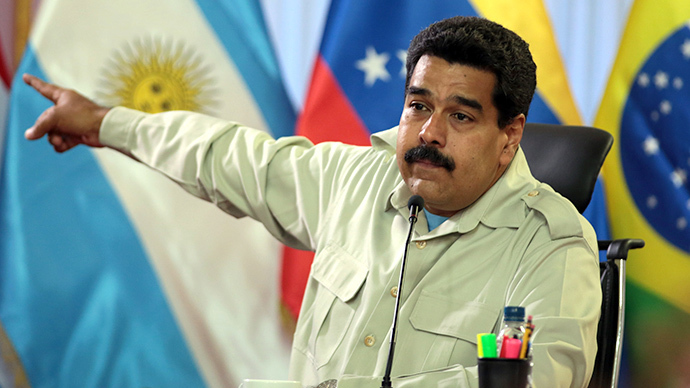 "A group of fascists with their aggressions want to take us away from peace," Maduro said. "They are not going to do that. And we are going to show them." CNN has requested meetings with Venezuelan officials. Both CNN and CNN en Español were invited to a Maduro news conference scheduled for Friday afternoon. "CNN has reported both sides of the tense situation in Venezuela, even with very limited access to government officials," CNN en Español said in a statement, adding that at the time of the credentials announcement, they were seeking an interview with the president. "We hope the government will reconsider its decision. Meanwhile, we will continue reporting on Venezuela in the fair, accurate and balanced manner we are known for." 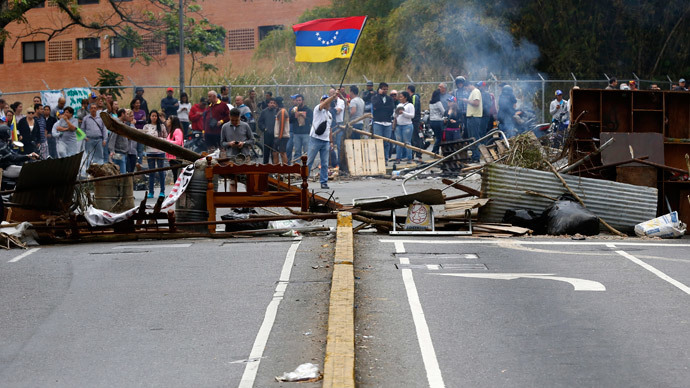 Local television networks have offered very little coverage of the protests, Reuters reported, leaving opposition leaders to use streaming websites on unreliable broadband to speak live to fellow Venezuelans. Maduro ordered that Colombia-based network NTN24 be removed from Venezuelan cable after it showed live coverage of the demonstrations last week. The move was criticized by the likes of Reporters Without Borders. Maduro, who was elected last year as the heir apparent following the death of long-time President Hugo Chavez, has accused the opposition – which he calls “fascists” – of fomenting a coup and inciting violence. The majority of the opposition consists of middle class students who are frustrated with the country’s sputtering economy and soaring crime rate, and are seeking a regime change. They also allege that the recent presidential election was rigged for Maduro. Venezuela’s ruling party, meanwhile, has long maintained that the US is playing a role in propping up the country’s opposition, and seeking to subvert the Maduro administration. That vitriol was sustained during Hugo Chavez’s tenure as the country’s leader; he often referred to an unsuccessful 2002 coup which heavily implicated US coordination. Earlier this week, Venezuela expelled three US diplomats from the country, alleging they were working with opposition members against the government. The US State Department has denied the accusations. 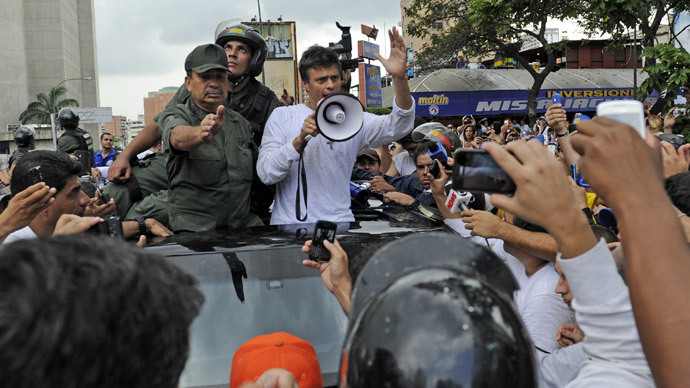 The latest spout of violence came on the heels of opposition leader Leopoldo Lopez’s surrender to government authorities during a large rally in Caracas. Lopez, who has recently become a rising star among Maduro opponents, is alleged to have played a role in the 2002 coup attempt. Lopez, the Harvard educated 42-year-old leader of the Popular Will party and a former mayor, is being held responsible for the casualties that have resulted as demonstrators continue to clash with government forces. Though according to his lawyers, prosecutors have dropped the most serious charges of murder against him.